In case you’ve been wondering what that beautiful 36-story pagoda on Brickell Key was, the answer is Asia luxury condominiums, one of the highest standards of luxury living in all of Miami. This 36-story beautiful glass building is inspired by traditional Asian architecture and design, both inside and out. Located at 900 Brickell Key Boulevard, Asia is your very own island paradise. Developed and designed by the 200 year old Swire Properties, seasoned development professionals in London and Hong Kong, the $750M project has turned into one of the most iconic buildings in all of Miami. This 122 unit masterpiece currently has two, three, four, and five bedroom unit available for sale. Two bedroom 1,326 square foot units start at $1.25M while five bedroom penthouse suites with 4,954 square feet of living space are selling for $8.8M. No matter your budget or lifestyle needs, Asia can accommodate your dream for an island paradise in Downtown Miami. Units are spaced out appropriately at Asia luxury condominiums with just three to five units per floor, depending on the floor. Every luxury residence boasts cavernous 12 foot ceilings, a full two feet more than the ten foot standard set by many luxury condominiums in Miami. Floor to ceiling glass windows provide plenty of natural light and breathtaking panoramic views of Downtown Miami, the Atlantic Ocean, and the Intercostal Waterway. Kitchens feature the very best in state of the art appliances and some come with a built-in cappuccino maker. A portable touch screen console in every luxury condominium at Asia gives you on-demand access to all building amenities and residence controls. Your guests will be wowed when they enter the beautiful two-story lobby complete with Asian-inspired design, art, and music. Relax on the pool deck with spectacular views or take a dip in the heated pool. Every community member at Asia luxury residences in Miami has access to private storage and two secure parking spaces. Private elevators get you to your residence safely, and the entire building is equipped with fool-proof biometric security locks. Get a workout in the state-of-the-art fitness center that is staffed with fitness professionals 24-hours a day. 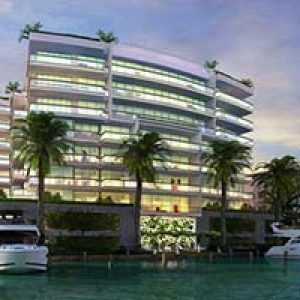 Being able to escape from to your very own island paradise is perhaps the best feature of life at Asia luxury residences in Brickell Key Miami, but you will be just steps from the very best downtown Miami has to offer. The Shops at Mary Brickell Village and the Brickell financial district are just a few hundred yards away, but your island paradise keeps you free from the traffic and noise of these areas. You’ll also have quick access to I-95 and both Miami and Fort Lauderdale International Airports as well as other vibrant and bustling South Florida communities, Asia luxury condominiums on Brickell Key offers a truly unique luxury living experience second to none in Miami!